These Xtreme Mini V's are made from very hard poly carbonate (clear) material which, due to its strong nature, will resist compression and wear and, in turn, leads to better overall precision and strength for your builds. The Xtreme Wheels are designed to be used as a heavy duty alternative to the Delrin Wheels in applications such as CNC Routers/Mills where force and weight are introduced into the system. So, while the Delrin Mini V Wheels work great for most light load applications, the OpenBuilds Xtreme Mini Wheels can be used for builds where heavier loads are required and less compression in the delrin is desired. Many of these wheels could be added to a gantry to allow for an even distribution of the load across them. Each wheel is carefully milled for consistent high precision and tolerance. 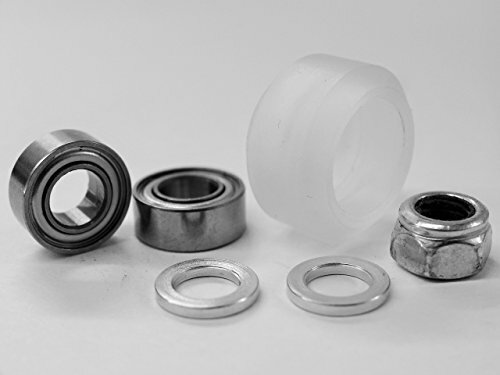 Each Wheel Kit Includes: (1) Xtreme Mini V Wheel (2) Mini V Bearings (V3) (2) Mini V 1mm Precision Shim (1) M5 Nylon Lock Nut Also, be sure to grab the screws and spacers of your choice here: Low Profile Screw (25mm for use with 1/8" Plate and 30mm for 1/4" Plates with the exception of the C-Beam Gantry Plate & Mini V Plate which uses 25mm) Aluminum Spacers (choose between 6mm and 1/4") Eccentric Spacers (choose between 6mm and 1/4") Note: Usually for a standard gantry plate you will need two Eccentric Spacers as well as two Aluminum Spacers The OpenBuilds Xtreme Solid V Wheel is great for use with the V-Slot Linear Guide System. If you have any questions about this product by OpenBuilds, contact us by completing and submitting the form below. If you are looking for a specif part number, please include it with your message.